New York State generally has a seven-game regular season. In Section 6, which covers far western New York, teams that don’t qualify for the sectional playoffs, may qualify for the “Chuck Funke Bowl”, an NIT-like tournament. For the regular playoffs, it’s a three-round setup, except for Class D, which only has four teams. So, the ‘first round’ is just an eighth regular season game. Teams that don’t qualify for the Chuck Funke Bowl have the option to schedule additional games over the next two weeks. One of those “Match Games”, as they’re sometimes called, was played between Tonawanda and Springville Griffith. The game, as many of the Match Games and Chuck Funke Bowl games, they’re played mid-week. This one on Wednesday night. The only such game in the area. The wind and rain was a problem throughout the early part of the game. A strong 17 mph wind coming from the west made for a brutal kickoff when combined with the rain. The 2-5 Tonawanda Warriors were taking on the 0-7 Springville Griffins. The game was played on a pristine, turfed field, with a few hundred fans turning out. Free admission might have helped. In New York, admission for football games is usually very low, if at all. $1 or $2 tickets is common. And free admission for schools is also common. A slow back-and-forth game that slowly looked like Springville’s eighth loss gave way to a bit of excitement in the fourth quarter. Springville scored on a 1-yd TD run after a long pass with 3:43 left in the game. And then recovered the onside kick. A 4th down stop turned the ball over on downs. And then, a defensive stop with seconds left led to a last second improbable attempt to tie the game. Which didn’t work out. But, the game did get interesting for the few hundred still hanging around through the wind and the rain on a cold Wednesday night. With the long Wednesday night drive, I wasn’t heading far for Thursday. So, a short drive to Pittsburgh for the Pittsburgh City League Semifinal between USO and Westinghouse. A big game for Westinghouse, looking for a trip to the championship and their first title since 1996. But things weren’t looking good after the first quarter. The Bulldogs defense just wasn’t working. USO opened up with a two score lead. And then Westinghouse marched down the field for a score, and followed it up with a quick pick-six to take a 16-14 lead. After a turbulent third quarter, the game settled in with a defensive struggle by the Bulldogs held on to their slim, 4-point lead. It was a fun night in Pittsburgh. Good Luck to the ‘House as they take on ‘Dice for the championship Saturday at noon. Friday night, then, was a short drive west to Windham, Ohio. Ed Liddle Field was hosting a matchup between Division VII, Region 25 showdown between #2 Windham and #7 Southington Chalker. Just like the previous night, a 14-0 first quarter lead. But, it wasn’t going to finish like Thursday night. The entire second half was a mix of light rain and a game going through the motions. Though, just like Thursday, the fourth quarter was scoreless again. Though not nearly as exciting. On Saturday afternoon, a unique game took place at Lakewood High School in Hebron, Ohio. Wheeling Central Catholic (WV) and Portsmouth West had scheduled a game but started looking for a neutral site. A series of happenstance led them to seeking out Lakewood HS’s Lancers Stadium to host the game on a Saturday afternoon. The Wheeling Central Maroon Knights were 99 miles away, and the Portsmouth West Senators were 114 miles. So, Hebron made the best of a bad travel situation for Portsmouth West. A decent contingent of fans for both teams made the trek for the 1:30pm kickoff. The original forecast of rain giving way to a cool, but incredibly blustery cloudy afternoon. 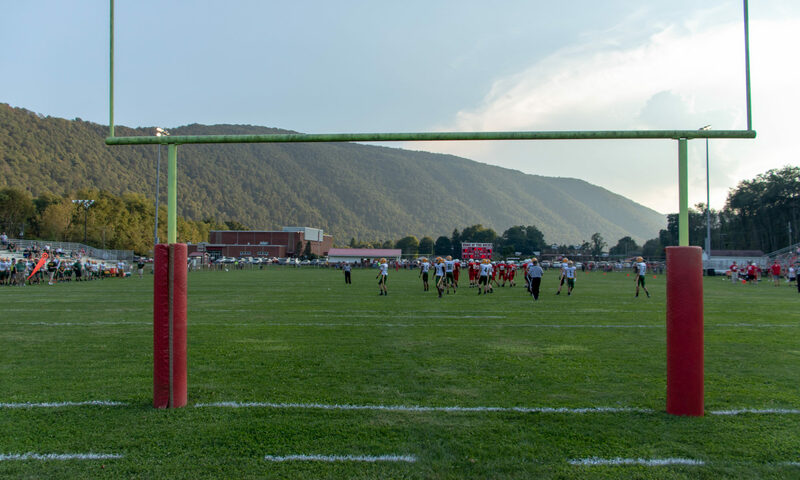 Wheeling Central started out with a 20-0 lead, before their QB went down, and Portsmouth West began mounting a comeback in a game originally destined for a running clock. The wind played a big factor at the end of the third quarter, when the Senators well-advised time-out forced Wheeling Central to kick into the heavy wind and basically gain no yardage on the kick. But, turnovers ruled the day for the Senators, and the last minute possession didn’t work out for the visitors from Ohio. Wheeling Central hung on, for the 32-30 victory. Despite missing out on rain in the early game, it was the fourth straight day with rain for at least some of the game. And boy, did it rain hard to start the night game between Tuscarawas Central Catholic and Malvern. Malvern started the scoring, and it looked like the rain and wind was going to neutralize the game. But, intermittent spells of rain and wind gave way to long stretches of dry, but very cold, game play. And that’s why TCC managed to make some headway in the second period and take the lead. For the third time this weekend, a scoreless fourth quarter. 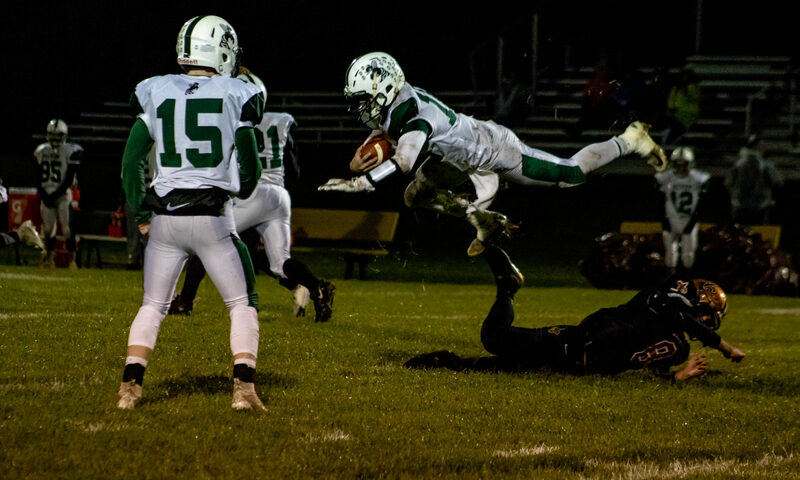 It was clear Malvern was not coming back. After that, it was a cold two-hour drive home. Just 943 or so miles and five games in three states. For more photos from this weekend, click HERE.